One of my friends was, to put it mildly, quiet upset today. He received a cell phone bill for, drum roll please, $400. I knew that he recently switched carriers and got a new phone and thought that the high number was due to him buying the phone from the carrier and the carrier charging him for this month and next month, not an uncommon practice. Turns out it's his second month. Also turns out he likes to talk, a lot. He's got a 400 minute plan, subtract weekends, that's an average of 20 minutes per day. However, he's been spending an hour to an hour and a half per day! With that kind of usage, you can burn through your minutes in less than a week. What happens with the other 3 weeks? Thirty five cents per minute, at least 60 minutes per day for 15 days plus the $30 plan cost plus taxes, fees, charges, yep, that's $400. Here's a lesson to all of you, it's 400 minutes per month, not 400 minutes per day. Take a calculator, divide your total minutes by 20, that's your daily allowance. And having rollover minutes only helps if you have minutes to roll over. Every morning, Shlomik watches cartoons and drinks from his bottle while we both get ready to go outside. Yeah, I know, he's too old for a bottle, but it's less mess and the only safe way to change him. The trick though, is measuring out the juice so that he would finish by the time we leave. Last Friday Shlomik still had half a bottle left and absolutely refused to give me the bottle, both at home and at the group. He ended up taking the bottle in with him. I forgot to tell my dad, who picks up every day, to make sure to get the bottle back and the bottle is probably gone. The same thing happened today. The bottle wasn't empty and Shlomik refused to give to me. I tried reasoning with him, telling him to put it on a box and it'll be there when he comes back in the evening, asking him for the bottle, telling him that it'll get lost if he bring it to the group. No dice. Then I had an epiphany. I offered him a trade, his bottle for a cookie. Success! He gave me the bottle and took the cookie. Ironically, instead of eating the cookie, he ended up holding it in his hand most of the time. 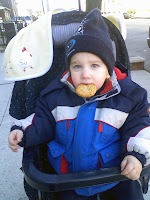 When I reminded him about the cookie as we were walking, all he did was to just place it in his mouth. I received an interesting email from a client. I made an online application for this client for managing a database of client and workers. There's 3 ways to find a worker, application number, name and url. The email was from the manager and the problem that she was having is that she entered the wrong application number when she was entering a worker and if I could fix it. That was the email. No application number entered, no correct application number, no worker name and no url. The whole request was "I entered wrong application number, please change it." Well, I feel kinda flattered, she thinks I'm psychic. Then again, this is the same client that has personnel copy/pasting the page when I ask them for url and sending the url when I ask them to copy/paste the error on the page. My favorite is alway the "it's not there" excuse. "Read to me the options from the top." Do you read books? Newspapers? Then how come when you sit down in front of a computer you get tunnel vision and see nothing besides the 100x100 pixel square you're looking at at the moment?! A guy from my shul wanted me to take a look at his computer. First, he wanted me to come to his house and look at it there, not gonna happen. Then we had a discussion about when he can come over and bring the computer. I suggested Sunday afternoon, he asked about Saturday night, I agreed. The guy calls me Saturday evening, says he'll come in around an hour. Now have in mind that he knows I have a 2 year old son. He comes in 2 hours, calls me on my house phone even though I gave him my cell and specifically told him not to call my house phone. So at around 8:30PM this genius rings my doorbell, did I mention I have a 2 year old kid and incidentally, he has kids too so he should know better. Now here's the kicker, he wants me to look at the computer right now, at 8:30PM while he stands and watches. I tell him, no way, not gonna happen and that he should leave the computer and come back Sunday. His repose is that he'll take the computer because he doesn't want to leave it and will come back Sunday afternoon. He knows me, I know him, for more than year, he doesn't want to leave it in my house. I tell him that I would have to run rootkit, malware and antivirus scans and that it would take up to 3 hours or more and that I will not be sitting there with him for those 3 hours no matter when he brings the computer. To demonstrate his great knowledge of computers he tells me that adaware takes 15 minutes to run. Yeah, sure, the minimal surface scan, good job. The meeting ends with me telling him that if he will not leave the computer today or tomorrow and will insist on sitting there and watching me, like I got nothing better to do, he can take the computer and not come back today or tomorrow. Honestly, some people have no idea what a business is or how it's run. Sure, I can come to your house and sit there and fix your computer and then I'll give you bill for a couple hundred dollars. And where have you ever heard of a computer repair center that would let you sit there and watch over the tech's shoulder as he's working. On the other hand, maybe I should have told him that I'll come to his house, really hate house calls, and how much he's gonna have to pay me. Though the way he was acting, let him go to geek squad, he mentioned them in our conversation by the way, have them destroy his computer and charge him 3 times more. Maybe that'll be a learning experience for him, maybe not.